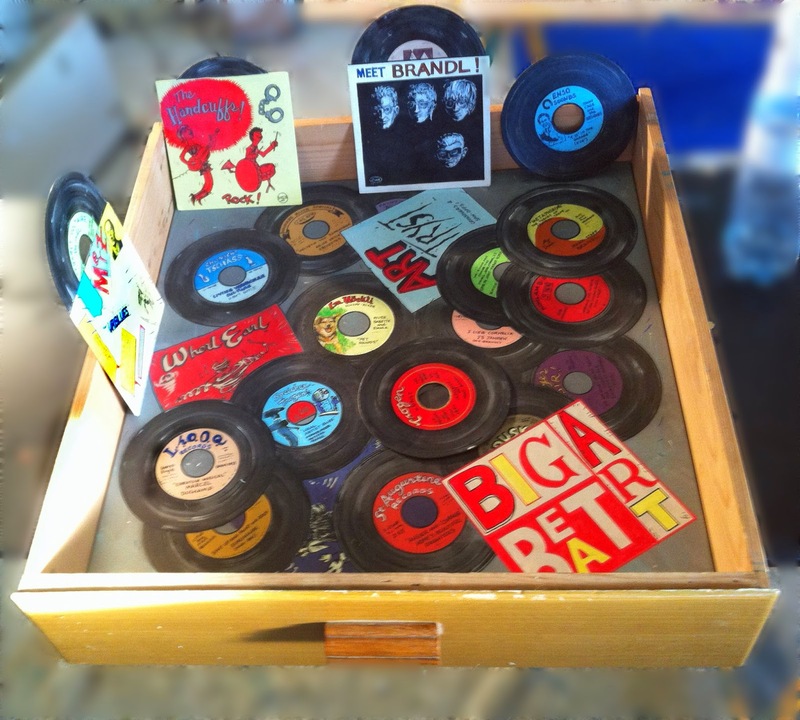 Here are some quick photos of my art object of 2011, Drawer of 45s. It is a drawer with a painting in enamel, oil and acrylic on canvas and several additional cut-out paintings in enamel, oil and acrylic on cardboard. They mimic old 45 single records. Each is an homage to various people and interests of mine; the labels are additionally allusions to various actual record labels and a couple sleeves. The 45 presaging the creation of my actual Theme Song "Shut Up and Paint" by the Handcuffs. Just a hint of an imaginary sleeve for something about Vlies und Vlügel, or Fleece and Flock, both (tm), characters from a comic by Th Emil Homerin and I of several years ago. Something we did just for fun. You know the "Meet the Beatles" album, I'm certain. Well here's a "Meet Brandl" 45 sleeve. Top left me about now, top 2nd from left me in the 80s, top right me in the 70s/late 60s, bottom, me a wee lad, as Zorro which was often then. A 45 for the famous 4' 33" of silence piece by John Cage. I always fantasized performing it myself with a Garage Rock Band, like The Outsiders, whose hit "Time Won't Let Me" was fabulous. John is seen with his cat. i was at his 70th birthday party on a boat on Lake Michigan and talked to him. We talked about art and music, but mostly cats and mushroom hunting. The others references are to his an my interest in Zen. A friend of mine, composer Kyle Gann (with whom I collaborated on an installation back in the 80s in Chicago) wrote a great book about that Cage piece. My painting-object-usually-presented-as-an-installation thing. Based on a drawer of 45s.